Sometimes, you have a frustrating day where you fall behind in your work and are interrupted countless times and you get even further behind. On those days, sometimes you just need some quiet, peaceful music to calm you down. I haven't had one of those days today, but I could have used Madeline Ava's music yesterday. It's quiet, sometimes funny/cute, and does have that calming effect. Her voice is very familiar, drawing comparisons to other artists like Hannah Georgas, Bella Ruse, and so forth. And I always like "fringe" instruments as the main accompanying sound - there's lots of ukelele in her music, which is great. 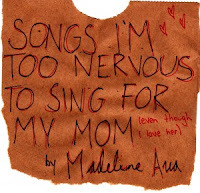 You can calm yourself with Madeline Ava's many albums over at CLLCT.